In spring 2017 Apple released a new iPad. Without any keynote, without any event – just with a press release. It’s quite an existing tablet though because the iPad 2017 is the cheapest iPad Apple ever released. Starting at just 329$ it’s an interesting alternative to the very expensive iPad Pro. I’ve been using and testing the 2017 iPad for over a month now. At the beginning, I checked out iOS 10 and then switched to the public beta of iOS 11. How good is this tablet? That’s what you’ll find out in this review. The design of the new iPad did not change much compared to all the previous generations. It kind of looks the same – like all iPads. That’s not a bad thing though. As we are used to from Apple the build quality is excellent. Like with all iPads the body is completely made out of aluminum. That’s why it feels very high-end in your hands. I like the full metal body much better than the glass back of the Samsung Galaxy Tab S3. It is much thicker though. While the iPad Air 2 was very thin with just 6.1 millimeters the new generation is pretty thick with 7.5 millimeters. It’s a lot thicker than a lot of Android tablets and even a couple of competitors with Windows are thinner. It’s not the lightest iPad as well but that’s alright since we’re getting an aluminum body here. The Wifi version weighs 469 grams and the LTE version is 9 grams heavier. You cannot get it in rose gold, instead, you can choose between the colors silver, space gray, and gold. As with previous iPads, the black bezels around the 9.7-inch display are pretty thick. We’re getting a 1.2-megapixel front camera above the display and the usual home button underneath the display. Integrated into the home button is Apple’s fingerprint reader called Touch ID. With this, you can unlock your device or authorize purchases in iTunes. While the iPad Pro has four very nice speakers the 2017 iPad only had two located at the bottom. The sound quality is certainly alright but a couple of competitors offer better speakers. Between the two speakers is a Lightning Connector. On the sides of the tablet are volume rockers, a power button, and a 3.5-millimeter headphone jack. If you’re getting the LTE version there’s a SIM card slot as well. You’re not getting the best iPhone camera with this iPad. Instead, there’s an 8-megapixel back facing camera on the back without the support of a LED flash. We also do not get any connectors for an optional keyboard and no, you cannot use the Apple Pencil either. iPad 2017 Display: What happened Apple? Let’s take a closer look at the 9.7-inch display. As usual, we’re getting a resolution of 2048 x 1536 which Apple calls a Retina Display. The pixel density is quite high at 264ppi and it is bright enough and colors look nice. It is not the best IPS display Apple ever shipped though. Unlike the panel of the Air 2, the display is not fully laminated here. That means that you’ll be able to notice a small gap between the panel and the touchscreen. We’re seeing that a lot with cheaper tablets but that’s something I really didn’t expect Apple to do in 2017. Another disappointing aspect of the display is that there does not seem to be an anti-refective coating. While the display is usable outside in the shade it transforms into a mirror in direct sunlight. So, this is definitely not the best display Apple ever shipped. But it is the cheapest iPad the guys from Cupertino ever released so… I guess we can’t expect the best of the best here. There are a lot of improvements when it comes to performance. Inside the iPad 2017 sits an Apple A9 chip with an integrated M9 coprocessor and 2GB of RAM. To compare: The iPad Air 1 had an A7 chip, the Air 2 an A8X chip and the new Pro versions have an A10X processor. 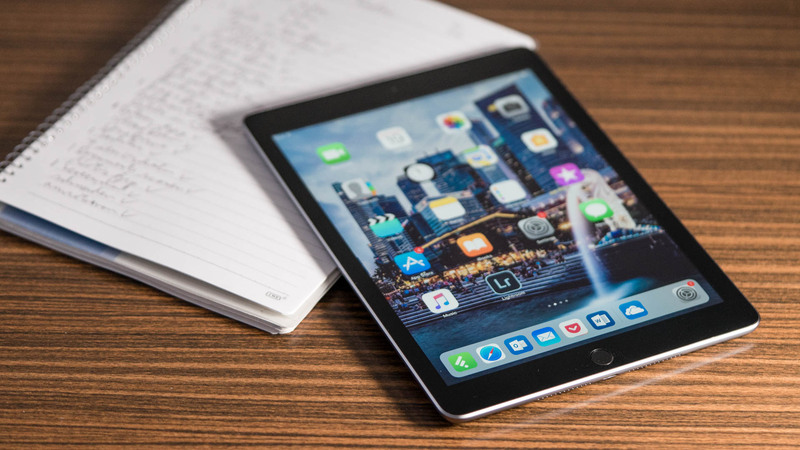 In benchmarks like Geekbench 4, the new iPad is a lot faster than the Air 1 or Air 2. In the Single-Core-Test it gets a result of 0000 points which is a lot better than with previous generations. The Multi-Core-Test achieves 0000 points which is about the same compared to the Air 2. While using the tablet daily I’ve had no complaints concerning the performance. iOS runs very smoothly, I could use the Safari browser with a lot of apps open and even the split view mode runs without any problems. I could also play games like Star Wars: Knights of the old Republic without any lags. That’s to be expected with new iOS devices though. Apple is very good at optimizing hardware and software. You don’t get that many storage options when buying the new generation. Instead of having at least three choices you can only choose between 32GB or 128GB. For most 32GB should be fine. If you’re planning on storing a lot of data locally you should think about getting the 128GB tablet though. Remember, there is no microSD card slot in any iPad. Other hardware features include Wifi 802.11 a/b/g/n/ac, Bluetooth 4.2 and optional LTE. With the LTE version, you’re also getting GPS support. If you’re buying a new iPad in the summer of 2017 you’re getting it with iOS 10. That is Apple’s current stable operating system. iOS 10 works on the iPad just like on any previous iPad or iPhone. If you’ve had one recently you won’t find many changes here. While iOS 10 is stable and alright it is not the best software for iPads. Apple is going to release iOS 11 in the fall of 2017 with a lot of improvements, especially for iPads. I already installed the public beta on mine and so far I really like it. Starting in iOS 11 the iPad is getting a new dock which you can populate with a lot of apps of your choice. You can access the dock from anywhere by swiping up with your finger. Very useful is the multitasking feature. From the dock, you can place any app next to another app and use them side by side. Thanks to the split view mode you can edit a Word document on one side and research inside the browser on the other side. You can also use the new drag and drop feature and drag links, pictures or other elements from one app to another. With iOS 11 we’re finally getting a files app. We’ve been waiting for this feature since the first iPad. With the files app, you can access files saved on your devices and even access files from cloud storage services like iCloud, OneDrive or Dropbox. I really like iOS 11 on iPads thanks to the improved multitasking, the drag and drop feature and the better keyboard. You can check out the best new features in iOS 11 here. The battery life has always been very good on iPads and that is the case with the new one as well. According to Apple, you can expect a runtime of up to 10 hours and that is true depending on the conditions you use it in. In my battery test, I got a battery life of 000 hours. Compared to other tablets, that is a very good result but there are a couple of Android tablets with a longer battery life out there. I test the battery life in all my reviews always the same way. I’m running an HD video over and over again until the tablets shut itself off. Brightness is always set to 50 percent, Wifi is activated and there are no social networks like Facebook installed. In my opinion, the 5th generation iPad is a very good tablet. Yes, it is thicker than the Air 2 and the display is not as good either but the performance is a lot better. At the same time, the build quality is excellent and I really like iOS 11. The iPad 2017 is not the best iPad out there but for just 329$ I can recommend it. Apple iPad 2017 Review:The Apple iPad 2017 offers a great value for your money. Its performance and battery life are excellent and the selection of apps in iOS is great. Don't want to afford an iPad Pro? This is the iPad to get.